Future explorers of Mars got a literal leg up thanks to a NASA research grant provided to a student space project. The Mars Gravity Biosatellite Program announced September 21 that they have received a $200,000 NASA advanced projects development grant. The funding will support development of a full payload engineering model, as well as make possible a number of tasks that push the project nearer to a real-time liftoff. The Mars Gravity Biosatellite Program is the first ever mission to study the effects of Martian gravity on mammals, a fundamental step moving humans out beyond low Earth orbit to the red planet. Initiated in 2001, the effort is student-driven, as well as being an international space collaboration. The initiative is uniting students from the Massachusetts Institute of Technology (MIT) in Cambridge, Massachusetts and the University of Queensland in Brisbane. Point of the project is to determine how humans will respond to the reduced gravity environment of Mars. 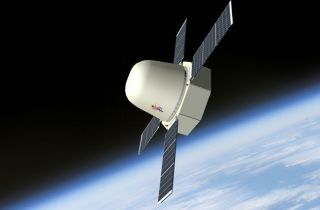 The Mars Gravity Biosatellite will carry a small population of mice to low Earth orbit aboard a spinning spacecraft creating "artificial gravity" identical to that on the Martian surface. If successfully launched, the five-week mission is designed to carry out the first in-depth study of how mammals adapt to a reduced-gravity environment. Data from this mission and its successors will be essential in determining future possibilities for human space treks outward from Earth. "With significant hardware and software prototypes now built and testing underway, the biosatellite has never felt more real," said MIT's Erika Wagner, Science Director of the Mars Gravity Biosatellite work. Wagner said that, particularly given NASA's current belt-tightening, free-flying research spacecraft are really poised to help keep science alive in orbit by offering a low-cost alternative to space station research. "We don't require valuable crew time or room on the space shuttle, and yet we can still conduct world-class research that will help keep our astronauts healthy on the Moon, Mars, and beyond," Wagner told SPACE.com. The new grant money from NASA will permit the Mars Gravity Biosatellite team to develop even higher fidelity models of the flight environment and life support hardware, Wagner pointed out. "Picture a life-sized model of the payload, fully capable of modeling flight-like environmental conditions and control. It will also enable substantial progress in systems-level refinement of our designs and significantly more student training," she added. A factoid provided by those working on the project brackets the issue. Astronauts traveling in microgravity experience significant skeletal degradation in the weight-bearing bones of their legs and lower spine. These losses of up to two percent a month are 10 times worse than that experienced by an average 80-year old woman with osteoporosis! "What we really want to do is help get humans beyond low Earth orbit. The Mars Gravity Biosatellite is a step we can take right now...not just Mike Griffin and the folks at NASA," Wagner said. While $200,000 won't propel the project immediately into space, the money does put the student work on the right financial trajectory. More fund-raising campaigns are underway, with Wagner noting that the current program budget is around $30 million, plus launch. "That's cheap by NASA standards...but still a ways to go from this end," Wagner concluded.